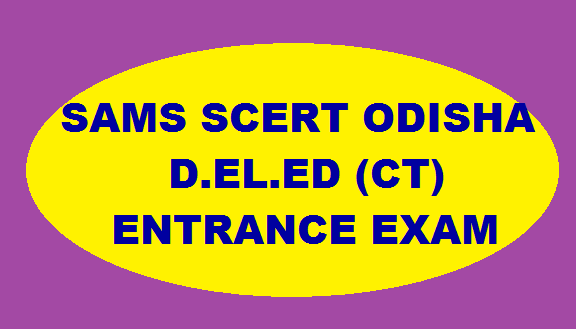 Odisha CT Entrance 2019: Teacher Education & SCERT, Odisha is organizing D.El.Ed (CT) Entrance Exam 2019 for the eligible candidates. By this Odisha CT Entrance exam candidates can get admission into Diploma In Elementary Education (CT) Course of SCERT. State Council of Educational Research & Training (SCERT) & The Directorate of Teacher Education conducted the Odisha CT Entrance 2019. D.El.Ed (CT) course is a Two-year course, you are selected for this course if you successfully pass the Odisha CT Entrance. If you want to be a teacher then after this D.El.Ed (CT) two-year course you can be a teacher in a Primary School of Odisha from Class I to V.
The D.El.Ed (CT) entrance exam will be conducted this year online mode at different centers all over the Odisha and a large number of candidates filed Odisha CT Application Form through online. No other mode is available of Odisha CT entrance to apply, only can only apply online mode. There is no chance of offline. A notification for invite CT Entrance application form 2019 is released by SCERT on the official website of SAMS Odisha. You can apply online at the SAMS Odisha portal www.samsodisha.gov.in. If you want to read official notification you can visit SAMS Odisha website or click on the link below. In this post, you can get all the detail information about D.El.Ed (CT) entrance 2019 Application Form, Eligibility, Syllabus from below in this post. Please scroll this page down for more information. SCERT Odisha invites applications for Odisha CT Entrance exam 2019. Odisha CT Entrance application form 2019 will be available on the SAMS Odisha official website wwww.samsodisha.gov.in from 1st April 2019 to 30th April 2019. You can apply CT Entrance 2019 through online at SAMS Odisha portal with the help of good internet connection and you must have a valid E-Mail Id and a Mobile number to register for CT entrance exam. Before applying the online Common Application Form (CAF) at SAMS Odisha website for Odisha CT Entrance 2019, you have to go through the Common Prospectus which is available at SAMS Odisha portal or a link below in this post for accurate information. You must have passed Higher Secondary Examination/ +2 Examination in Arts /Science / Commerce or equivalent from recognized Boards or Councils. SC, ST, SEBC, and PH must have secured at least 45% marks in aggregate. .
You must be ODIA as MIL up to HSC class level. from recognized Boards / Councils are also applied for Odisha D.El.Ed CT Entrance 2019. This year Odisha CT Entrance will be conducted online Computer Based Test and it has two sections. 4 Teaching Aptitude Solving problem of educational context, managing classroom and learning, Learner and learning related issues, goals of education, the role of various agencies and organization in the management of education, issues related to teaching-learning strategies. You should visit the website www.samsodisha.gov.in or below link in this post. Next page finds "Teacher Education͛ & SCERT" and Click on. Here in this page Click on "Register for Online Application͛" link. Here next page you have to enter email Id and Mobile no to register. You can log in to fill up the application form. Fill the application form and pay the required fee as mentioned above. After completion of online application form successfully, you can save or take a print out of confirmation page. You should reach in the Examination Hall 30 minutes before the commencement of the examination. Occupy only the seats allotted to you and not allowed to exchange their seats. You should reach the exam center before schedule time. No candidate will be allowed to enter the Examination Centre after the commencement of the examination. Please visit regularly for more updates regarding Odisha CT Entrance 2019.